All golf turf, all the time! Just in time for summer, numerous samples of bentgrass and annual bluegrass from golf courses in the region are starting to roll into the laboratory. Many of the recent submissions were found to be disease-free and were simply suffering from the rigors of constantly changing weather conditions. One week we have exceptional evapotranspiration demand, then seasonal heat and humidity, and then cool and rainy weather. All in all, it makes for a difficult growing year. At this point, we are in summer disease mode. Summer patch is the disease of the week. Samples of summer patch have been submitted to the laboratory from golf courses in New Jersey, New York, and Pennsylvania. We are also having fun with all the anthracnose samples. Interestingly enough, some of the yellow Poa coming in disguised as anthracnose, might really be annual bluegrass weevil damage. Most of these plugs do not have weevils present (so I can’t accurately diagnose them), but many of them have very suspect symptoms. There are loads of adult weevils on the plots at our turf farm and we even got a wad of duct tape as a sample (excellent monitoring tool!) that was covered with adult beetles, so beware of the dreaded hyperodes. Lastly, due to the relatively dry spring, we haven’t seen much pythium root rot/dysfunction in the lab. With summer-like conditions that include heavier rains and some local flooding, that is starting to change. In fact, we even had a couple cases of outright Pythium blight during the last heat wave. 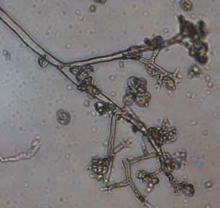 Pythium root diseases, however, are most common in super-saturated soils. 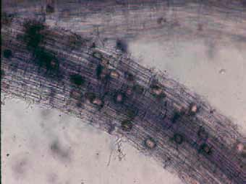 Pathologists often make a distinction between pythium root dysfunction and pythium root rot. Root rot is a disease of poorly drained (native) soil types that is caused by a myriad of pythium species. Root dysfunction is a disease of sand-based root zones and is caused by a couple of Pythium species. 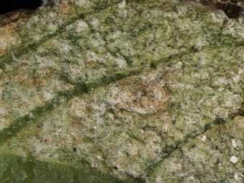 The most noted pathogen associated with root dysfunction is Pythium volutum. Most of the samples we see in our laboratory are root rot, not root dysfunction caused by P. volutum. And with root rot, there are almost always underlying issues with compaction, drainage, layering, poor physical structure, thatch, excess rainfall or irrigation, pocketed sites, and/or shade associated with the samples. In most of these cases, the site conditions alone will cause the turf to yellow and thin. So no matter how often and how much product you drench into the root zone, the turf will probably not perform well until the site conditions are mitigated. Fungicide intervention is all well and good, but a smart turf manager will take a pythium root rot diagnosis with a grain of salt and look to the underlying stresses to fix the problem. Downy mildew of impatiens was officially diagnosed in the Rutgers Plant Diagnostic Laboratory for the first time this week. This disease, which is caused by the fungus Plasmopara obducens, is all-the buzz with the landscape, greenhouse, and nursery crew at this time because of its destructive potential. Impatiens downy mildew is first evident on new growth as curled, yellow leaves. 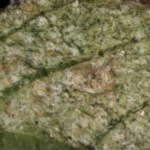 As the disease progresses, white mycelial growth (downy fuzz) becomes evident on the undersides of the leaves. Rapid defoliation and plant death soon follows. Impatiens play an important role in New Jersey landscapes as mass plantings in shady sites. Unfortunately, what beautifies the site also creates the perfect storm of conditions for the disease. High relative humidity and cool temperatures favor pathogen activity. Furthermore, the fungus spreads rapidly in overcrowded plantings through airborne spores that are easily dislodged and moved by splashing overhead irrigation and rain. There is not much to do once the plants are infected. Rapid detection and excellent sanitation practices are essential to stop the spread of the disease. Remove and destroy the affected plant material. Do not turn the dead plants into the soil. In fact, it would be prudent to carefully bag up the diseased plants and send them to a landfill. Professionals can follow quickly with protective fungicide treatments. Be aware that these treatments can be expensive and do not provide much curative control. Fungicides are best used as preventive treatments. The following materials are labeled for downy mildew control in impatiens for commercial applicators only: Adorn (fluopicolide), Aliette (fosetylal), Heritage (azoxystrobin), Pageant (pyraclostrobin+boscalind), Protect (mancozeb), Segway (cyazofamid), Stature (dimethomorph), Subdue Maxx (mefenoxam), and Vital (potassium phosphite). Researchers at Cornell University suggest making applications on 14-day intervals. Be sure to pick a different product each time and to use the product in a manner that is consistent with the manufacturer’s label specifications. I would also suggest that if you yank out downy mildew infected plants, it might not be too practical to replace them with more impatiens. I think it might be time to find something else for those shady sites!